The 2016 Lieutenant Governor’s Ontario Heritage Award for Excellence in Conservation has been awarded to Andrew Pruss, (Principal, ERA Architects), Les Mallins, (President, Streetcar) and the project team behind the revitalization of The Broadview Hotel. The award commends the contribution to the conservation of a heritage building and the community enhancement it fosters. The Broadview Hotel is a landmark heritage-designated building at the northwest corner of Queen and Broadview that functioned as a commu­nity hub for clubs, businesses, athletics and site for the public engagement of city-developing events. 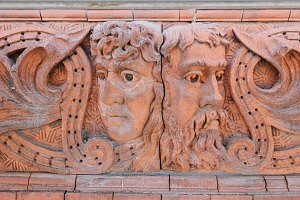 It was completed in 1891-2 by oilman and soap maker Archibald Dingman in the Romanesque Revival style of architecture The building, formerly known as Dingman’s Hall, anchors the end of a commercial shopping strip that begins just after the bridge over the Don Valley and terminates at the end of Queen Street East in the Beaches. 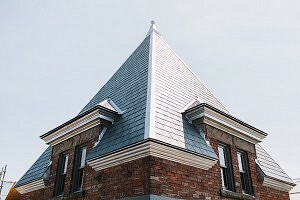 Its long-standing presence at the corner of Queen Street and Broadview Avenue make it an imposing and prominent beacon within the Riverside neighbourhood. Over 36 months, ERA Architects and the project team worked to conserve and maintain key architectural features of the 125-year-old landmark: rounded-arch and squared-head windows, decorative terra cotta panels, prominent turret with a pyramidal roof, wide arches and rusticated stonework on the ground floor. The development of the structure included an addition to increase its capacity. Its use as a hotel will return, with 58 guestrooms, a restaurant and cafe added to the ground floor and a dynamic rooftop providing stunning views of the cityscape. Exterior alterations include: the removal of fire stairs, window replace­ment, the reinstatement of entrances and storefronts, metal cornices on the facades, and masonry and glass additions. The hotel will welcome guests to the east-end beginning in spring 2017. ​Project photos are courtesy of Streetcar Developments. To review the article by Joanna Lavoie in InsideToronto.com, click here.